Did you know that, located just off the coast of Belize, lies part of the second-largest reef system in the world after the Great Barrier Reef in Australia? Well, it's true! The Mesoamerican Barrier Reef System stretches from the upper Yucatan peninsula all the way down to Honduras. And, because of how close the reef is to the coast of Belize, it is easily the country’s top tourist attraction, popular with both snorkelers and divers. 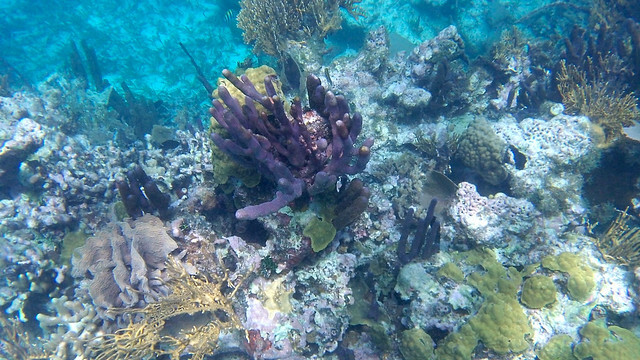 As soon as I decided I was going to Belize (and, more specifically, the laid-back island of Caye Caulker), I put snorkeling this reef at the very top of my list. And I knew that I wanted to do it with Raggamuffin Tours. Raggamuffin is based on Caye Caulker, and offers full-day (and multi-day) sailing/snorkeling trips that take in the Belize Barrier Reef. I had heard good things about the company before, and was super excited when my Intrepid Travel guide actually recommended one of their day tours to our entire group. Without much hesitation, all 12 of us booked in on the Hol Chan Snorkel tour for our first full day on Caye Caulker. Check out the video from this trip (be sure to watch in HD! ), and then read on for some highlights. The day of our sailing trip dawned windy, but mostly sunny — perfect for what we were planning to do. We were told our group would have a boat — the Ragga Gal — all to ourselves for the day, and we soon met our captain (Kevin) and first mate (Chilo). We headed out around 11 a.m. and sailed for about half an hour to our first snorkel stop of the day — the Coral Gardens. 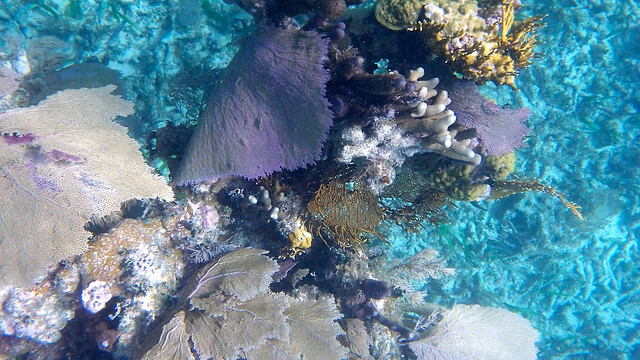 Here, the water is incredibly clear and you can float over coral of all shapes and colors. Our captain, Kevin, snorkeled out with us, pointing out specific fish and other sealife as we propelled ourselves through the warm water. I would love to come back here in the summer, when it's often possible to spot manatees in this area. After a nice length of time in the water, we climbed back onto the boat for lunch. This consisted of chicken and rice (a Belizean staple) as well as pasta salad and juice. It was delicious after expending so much energy in the water, and helped pass the time as a rain shower passed over head. After cleaning up from lunch, we motored over to Shark and Ray Alley — the place I was most looking forward to on the tour. 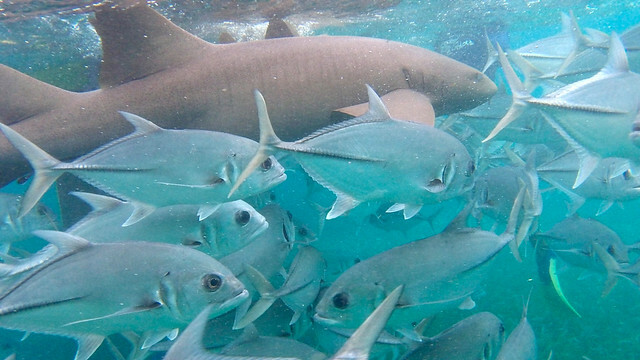 Here you can hop in the water with nurse sharks, stingrays, and all sorts of colorful fish. This used to be the spot where fishermen would come to clean their catches at the end of the day, and thus the local marine “residents” have been conditioned to be curious whenever a boat is in the area. For someone as obsessed with sharks as I am, this was hands-down the highlight of the day for me. Lastly, we headed into the heart of the Hol Chan Marine Reserve, close to where the waves were crashing on the reef. This area is protected, meaning we could not stray very far from Kevin or Chilo. This was actually fine, because they once again pointed out all the local marine life for us. Kevin even grabbed some of our cameras to snap photos and videos of moray eels and the sea turtles we were swimming with. The water here was deep, yet still very clear (especially considering the rough conditions on the surface). 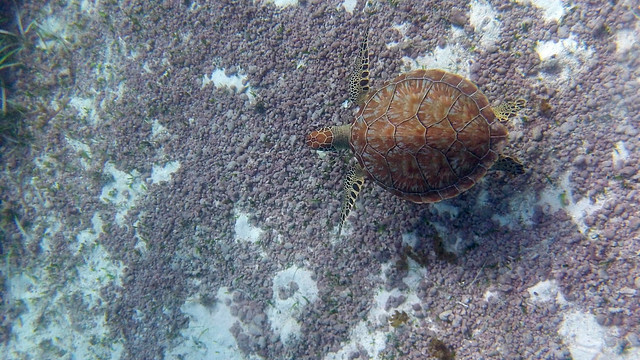 The highlight for me was definitely the turtles; I've always wanted to swim with turtles! 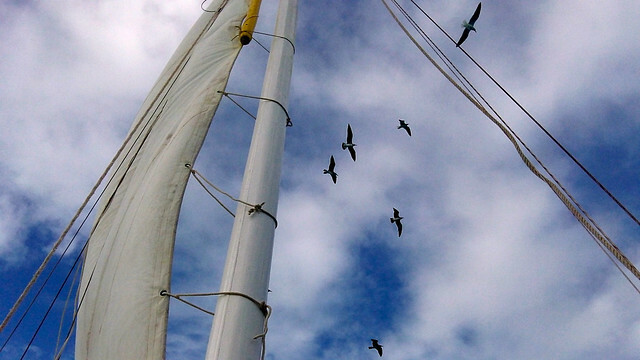 After our third and final snorkeling excursion, it was back on Ragga Girl for a leisurely sail back to Caye Caulker. The reggae music was pumping, the rum punch was flowing, and none of us wanted the day to end. 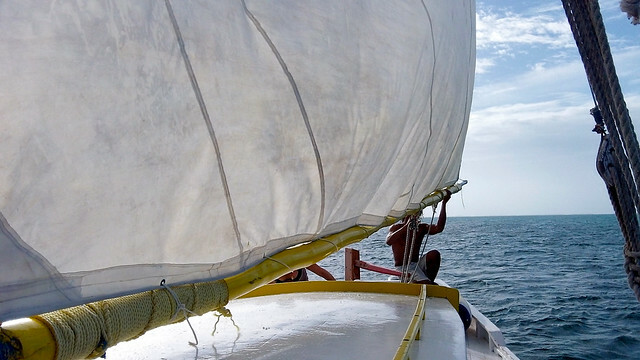 In fact, a couple of times we asked Kevin if we couldn't just sail right on past Caye Caulker and prolong the experience. So, would I recommend this tour? Absolutely. In fact, it was probably my favorite day of my whole 8-day tour through Belize and Guatemala. Not only did I get to swim with sharks and sea turtles, but I got to go sailing (I think I'm in love) with people I enjoyed hanging out with in one of the most beautiful tropical locations I've ever been. Plus, the food was good, our guides were incredibly knowledgable about both the ocean and Belize, and the price was fantastic for what it got you. What to bring: Swimsuit, towel, sunscreen, sunglasses, and a waterproof camera. You can also bring alcohol of your own with you on the boat, but the captain will ask that you refrain from drinking it until you're all done snorkeling. 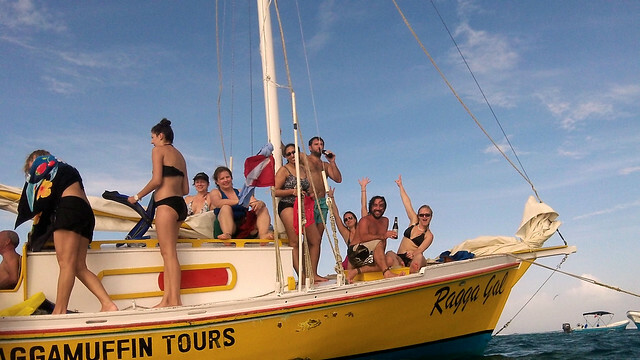 Things to know: Raggamuffin Tours is one of the more popular snorkeling operations on Caye Caulker (probably because of their sailboats and the fact that their captains/guides ROCK), so you'll want to book well in advance to make sure you get a spot. Is this tour something YOU would want to do in Belize? *Note: I received a complimentary Hol Chan Snorkel tour from Raggamuffin while in Belize. As always, though, all opinions and squeals of delight at seeing sharks and turtles are entirely my own. 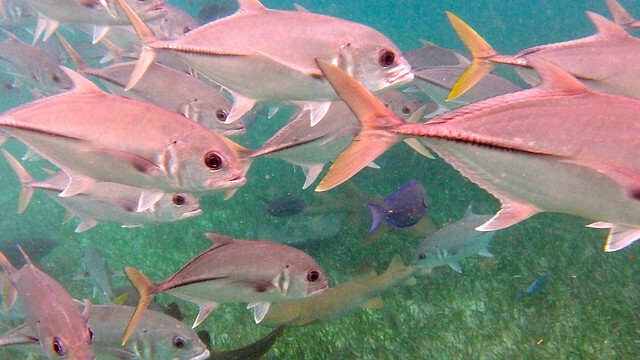 it’s surprising that Belize’s reef system, despite being second only to Australia’s Great Barrier Reef, is so unknown…or at least it seems to me. Anyway, this looks like an amazing trip; much better than the last time I went snorkeling in the Philippines. Actually, the flora and fauna there weren’t the problem, but rather that I hadn’t considered that I wouldn’t be able to wear snorkeling goggles over my glasses, and I didn’t have contact lenses. Being very short-sighted as I am, I mostly just saw blobs of unidentifiable colours float past me! Oh no! Bummer about your last snorkeling experience!! I agree about Belize’s reef being relatively unknown, though – I’ll admit to knowing very little about it before I saw it myself! Thanks! It was a really really cool place to snorkel! Ooh Amanda great spotlight on this tour company in Belize! I’m heading out to Central America for a couple of months starting next month so I’m definitely adding this to my itinerary! You definitely should! It was a fantastic day. I’d love to do one of their multi-day sailing trips sometime! Bummer about missing the whale sharks! That would be so epic. I haven’t tried diving yet, but would definitely like to some day. This is a tour I’d LOVE to do. I love snorkeling and and the reef there just seems amazing. 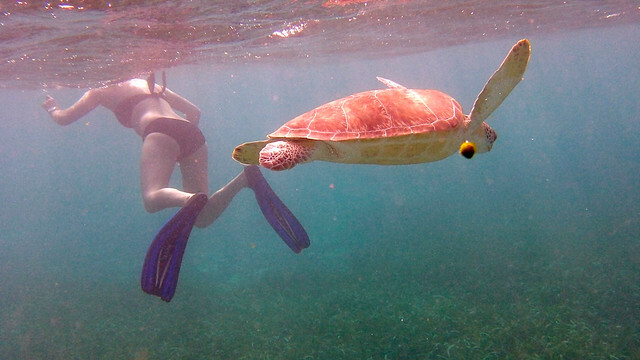 If you love snorkeling, then I think you’d love this tour! Plus, the people at Raggamuffin are all pretty awesome. I actually did the same tour some years ago and loved it! Still rave about the fabulous day we had! Thanks for bringing back the good memories! Such a fun time. I would love to do it all over again!! Glad to have brought back some good memories for you. I like your trip so much. To swim with the sharks and turtles are really awesome. I hope I can also do that one of these days. I hope you can, too, Kelly! It was really fun. Incredible! What a tour. We lived on the Great Barrier reef for years and were keen divers, then we booked a trip to Belize, then, bam, my wife got pregnant. 12 years later we still haven’t been. It’s very high on the list. Ah you definitely have to go, James! It’s such a cool little country!